Guys, I am crazy for these delicious Air Fryer Kale Salad Sushi Rolls! They’re crunchy, filling, and so, so fun to make! I use white rice to make these rolls, but you can use white, brown, or a mix to make your own favorite version of Air Fryer Sushi Rolls. These rolls are stuffed with toasted sesame kale salad and creamy avocado, then rolled in sriracha mayo and panko breadcrumbs and air fried. You could really make a whole meal of these babies. The rolls and the sriracha mayo are much easier to make than you’d think. If you’re new to making sushi, I recommend that you watch the video, so you can see the technique for making sushi rolls at home. If you want to see sushi rolling in action, I recommend checking out the video above to see how to put your roll together. Once you get the hang of it, you’ll be cranking out sushi like a pro! 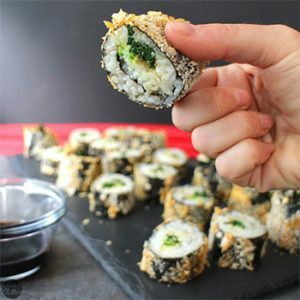 Guys, I am crazy for these delicious Air Fryer Sushi Rolls! They're crunchy, filling, and so, so fun to make! 1 tablespoon sesame seeds toasted or not - your call! ¼ cup of your favorite vegan mayonnaise I used Vegenaise. In a large bowl, combine the kale, vinegar, sesame oil, garlic powder, ground ginger, and soy sauce. With clean hands, massage the kale until it turns bright green and wilted. Stir in the sesame seeds, and set aside. Lay out a sheet of nori on a dry surface. 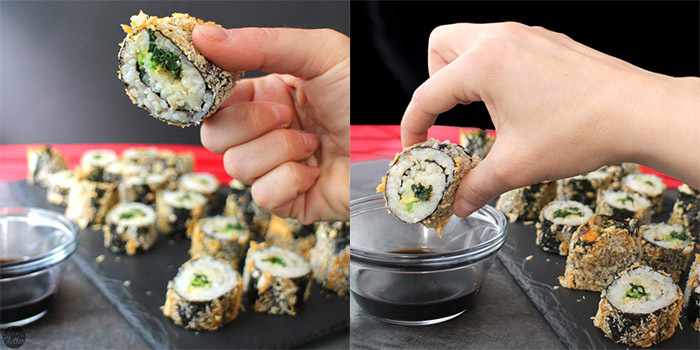 With slightly damp fingertips, grab a handful of rice, and spread it onto the nori. The idea here is to get a thin layer of rice covering almost the entire sheet. Along one edge, you'll want to leave about ½" of naked seaweed. Think of this as the flap that will seal your roll shut. On the end of the seaweed opposite that naked part, lay out about 2-3 tablespoons of kale salad, and top with a couple of slices of avocado. Starting on the end with the filling, roll up your sushi, pressing gently to get a nice, tight roll. When you get to the end, use that naked bit of seaweed to seal the roll closed. If needed, get your fingertips wet, and moisten that bit of seaweed to make it stick. Repeat steps 2-3 to make 3 more sushi rolls. In a shallow bowl, whisk together the vegan mayo with sriracha, until you reach the heat level that you like. Start with 1 teaspoon, and add more, ½ teaspoon at a time, until you have the spicy mayo of your DREAMS! Pour the panko breadcrumbs into a shallow bowl. Grab your first sushi roll, and coat it as evenly as possible in the Sriracha Mayo, then in the panko. Place the roll into your air fryer basket. Repeat with the rest of your sushi rolls. Air fry at 390F for 10 minutes, shaking gently after 5 minutes. When the rolls are cool enough to handle, grab a good knife, and very gently slice the roll into 6-8 pieces. When you're slicing, think of gently sawing, and don't press hard with your knife. That will just send kale and avocado flying out of the ends of your roll.